Do you have clothes that you no longer wear, but you are not sure what to do with them? While two of your options are to simply throw them out or to sell them at a garage sale, you might want to consider donating them instead. Not only does this eliminate the hassles of having to host a garage sale, but there are many other benefits associated with donating clothes to charity. Here is a look at just a few. Throwing away clothes typically means they are going to end up in a landfill. By donating the clothes instead, you help to save landfill space while also helping to reduce greenhouse gases. While many clothes are made from organic materials, landfills lack the oxygen that is needed to break these materials down. Therefore, the process of breaking down the clothes relies upon anaerobic digestion. This process results in greenhouse gas emissions, most of which escape into the atmosphere and help to accelerate climate change. Some estimate that recycling 100 million pounds of clothes is the equivalent of removing 26,000 to 35,000 cars from the road. In addition to being better for the environment, saving landfill space also has a positive impact on the economy. An estimated 12 million tons of clothing end up in the landfill every year. With landfills costing millions of dollars to build and millions more to operate, minimizing the amount of waste that is sent to them helps to reduce the dollars that are spent on maintaining them and building new ones. Making new clothes requires a complex manufacturing process that uses a great deal of energy. Recycling clothes by donating them helps to reduce the need to create new clothes, thereby helping to conserve energy. A number of nonprofit organizations collect clothes to help those in need. The way the clothes are used to assist others can vary widely. For example, some organizations sell the clothes at a low cost. Not only does this make clothing available to those who do not have a lot of money to spare, but the money is then used to help fund problems to further assist those in need. Yet other programs give the clothes directly to those in need. Some nonprofit organizations may focus on specific missions, such as providing people with professional clothes to wear at job interviews. Yet others may focus on providing clothes to families that have faced hardships, such as a house fire. Yet others may send the clothes to developing countries in order to support businesses or to provide clothing for those in need. By exploring the various charities that are available, you can select the one that best suits your personal mission. 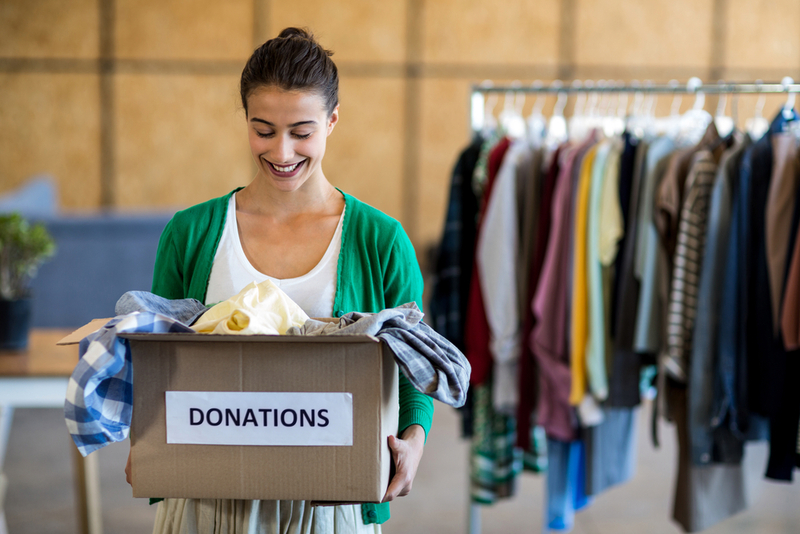 In some cases, nonprofit organizations require donors to drop their clothing donations off directly at a specific location. Others may set out collection bins such as those made by Securr to make it easier for donors to drop off their clothes. Once you have selected the charity that you wish to support, it is a good idea to give them a call in order to find out how the donations should be dropped off.